By the time she was eight-years-old, Cathy Lee, the Director of the San Clemente Seaside Senior Center, had lived in seven states. And though difficult for her - never having much time to make friends or for others to get to know her - this continuous meandering prepared her for the adaptability and flexibility she would eventually utilize in life, as well as her career. Intelligence, adaptability and flexibility are only a few aspects of this southern-born “Georgia Peach’s” make-up. She has also inherited an attitude of caring and giving from a mom who she still speaks to daily. Education was important in Cathy Lee’s family, and she spent her college years attending the University of Georgia where she obtained an elementary education degree. Upon completing college, she married and moved to Florida with her new husband, where she lived for fourteen years, raising her two children. A stay-at-home, PTA mom, she never utilized her degree to teach children, but found herself volunteering with seniors instead, until the demise of her marriage several years later. Jobs both volunteer and monetary were becoming more and more about people for Cathy Lee. With her enthusiasm, sparkling eyes, obvious gift of gab and quirky sense of humor, she connected with everyone she met, and it wasn’t long before Cathy found a new love. But sadly, the happiness of that new union was to be short-lived. After a few years of marriage, Lee became pregnant at 40 and lost her child. That trauma triggered a move to California, where the couple hoped to start anew. It wasn’t meant to be, however, and the effects of that loss eventually took its toll on the duo’s relationship. And before she knew it Lee found herself alone once again. 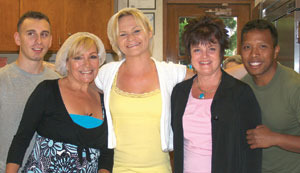 When Cathy Lee first moved to South County, having previously worked with seniors and looking for something to do to assuage the loss of her child, she applied for the part-time position of Activities Director at the Leo Fessenden Adult Day Healthcare Center on Calle Frontera in San Clemente. So for the next six years, as a member of Director Marilyn Ditty’s staff, Lee helped develop and provide therapeutic recreation programs for the seniors left at the center in their care daily. Friendship is also at the heart of what Lee does, and she credits the friendship and mentoring of Carol Nastasi and Marilyn Ditty with any success she might enjoy today. 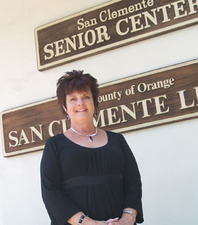 Under their leadership she kick-started a career that has moved from part-time Activities Director to full-time Director of the San Clemente Seaside Senior Center under the auspices of the South County Senior Services, Inc., for which she has been working for the past 10 1/2 years. And she says one of the best things about her job has been working with community leaders like Rex Tyner, Ralph Klaausen, Stephanie Dorey, Joe Anderson and Susan Ritschel. Although Cathy spends more time in the office these days, planning and developing programs and attending to administrative duties, and less time with her beloved seniors hands-on, she still maintains her connection with the myriad of mature adults (aged 50-100) who pass through downtown San Clemente’s Senior Center daily. For Cathy Lee this job is most importantly about making a home away from home for seniors. A place where they can exercise, play games, take classes, socialize, dance, laugh, joke and find help when they need it And she says she has learned much and grown in many ways in her position at the center. “One of the most important things I have learned is to treasure each moment,” Cathy pauses to quell the emotion showing just beneath the surface. “And that time is a precious commodity not to be wasted,” she adds, composure returning. With the whirlwind of activities available at the center, it doesn’t appear that much time is wasted by either Cathy, her staff of 3, or the 100 plus volunteers offering services there. The Center’s monthly calendar includes from three to 10 events daily, presenting re-occurring activities as well as special celebrations. When visiting the establishment one is amazed at what Lee and her crew accomplish in such limited quarters. It’s obvious they are bursting at the seams and are much in need of the new Dorothy Visser Senior Center soon to be built on Avenidas Rosa and Victoria, facing Victoria. As the center is growing in popularity and space, its director is broadening professionally and personally. Having faced the loss of a father, a child and two relationships, the illness of a sister, and the realization that she can’t fix every problem her adored seniors encounter, she has found out much about herself. Cathy cherishes her life in San Clemente as well. Her job at the Adult Day Healthcare Center brought her to the village, and she says living and working in the same city is the best part of being here, as well as being able to take a break, walk downtown or to the beach, and knowing practically everyone in town. With Cathy’s energy, experience and personality, that sounds like it just might be the perfect second career for her.